Happy Halloween everyone! What are everyone's plans for tonight? I don't know about you guys, but where I live, it is pouring down rain so I will most likely be staying cozy at home..or perhaps go to the mall with my friend to bring her kid trick or treating! Everyone that celebrates this day, stay safe and stay warm and dry! With the month of October coming to a close, I thought I would share some "pink" items for National Breast Cancer Awareness. First for some non lippies--I was given these strawberry milk flavored caramels from Japan this month and these were literally so tasty and one of the best strawberry milk flavored items I've ever had. Plus, look at that packaging! So weird yet cute at the same time! I also featured the Pure Seduction body spray scent by Victoria's Secret. This scent is just so juicy without being to sweet and is one of my newest favorites from VS. Next is a mini OPI Nail polish in the cutest textured frosty pink color that is fun for any occasion. And lastly, even though it's not really pink, this Evian facial spray toner is just nice for on-the-go. 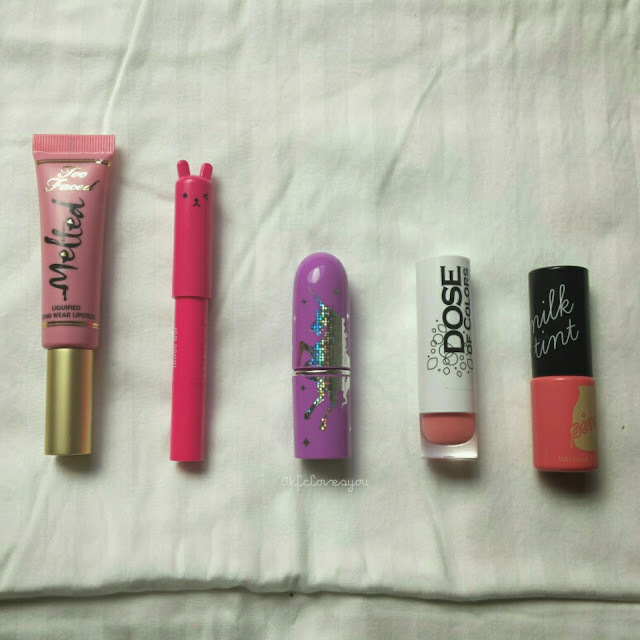 Now, my favorite part: Lip products! 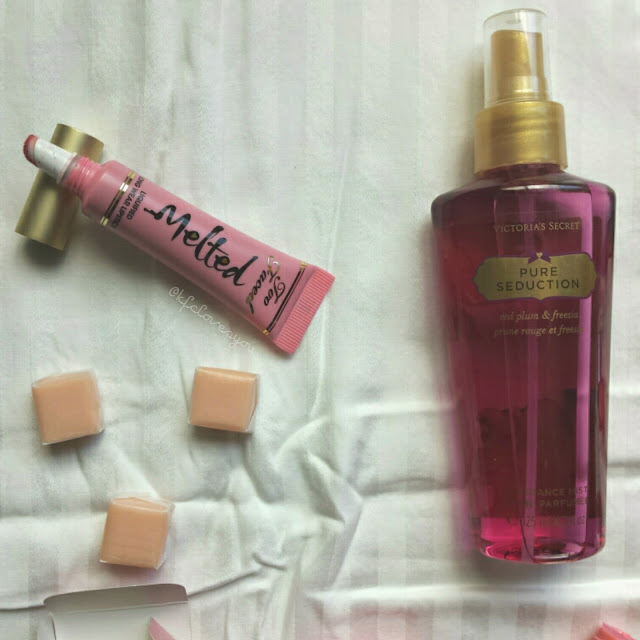 Too Faced Melted Liquid Lipstick in Melted Peony: I did a full review on this here. I love the formula on these and the color of this particular one. It isn't overly bright or pale, it's just right. 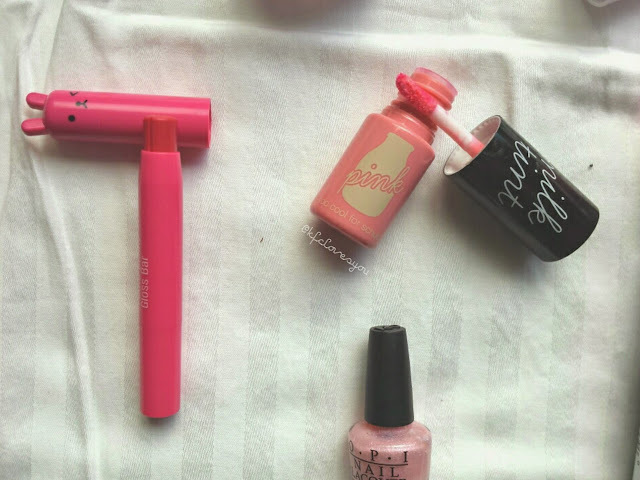 It is one of the prettiest lighter pinks I have in my collection that is very wearable and not overly Barbie. TONYMOLY Petite Bunny Gloss Bar: I love the packaging of this I mean c'mon, look at that face and those ears! 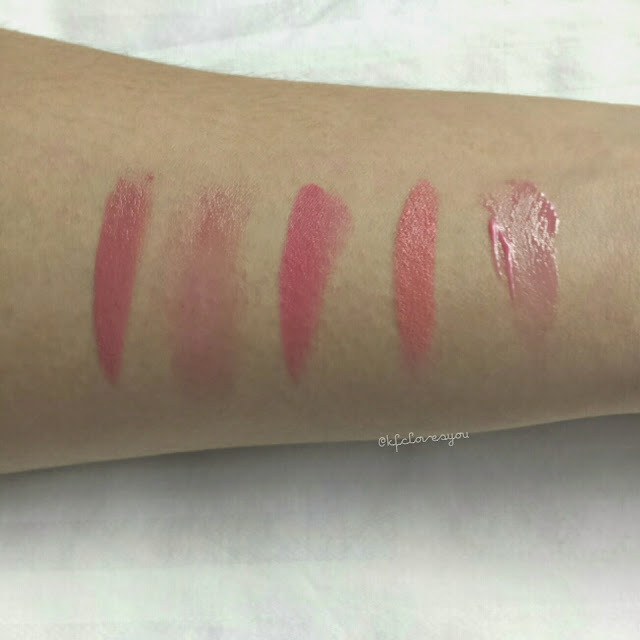 The balm itself is nice too and moisturizing while leaving a nice pink tint to the lips. 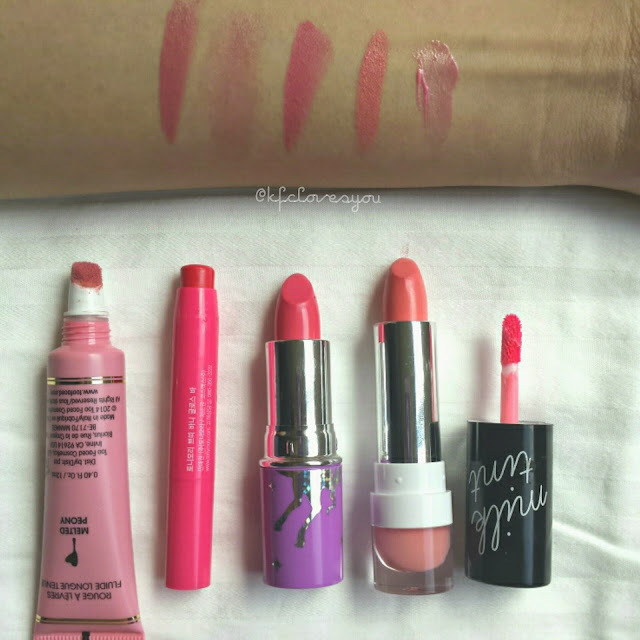 Lime Crime Geradium Lipstick: I also did a full review on this color here. This is one of the first Lime Crime products I've ever tried and I was instantly hooked. Not only is the purple packaging with the unicorn awesome, but the pigmentation and texture of this lipstick is just as awesome. This pink is bold that it makes a statement but it isn't overly neon or bright either. This lipstick definitely is a confidence booster and makes me feel extra girly. 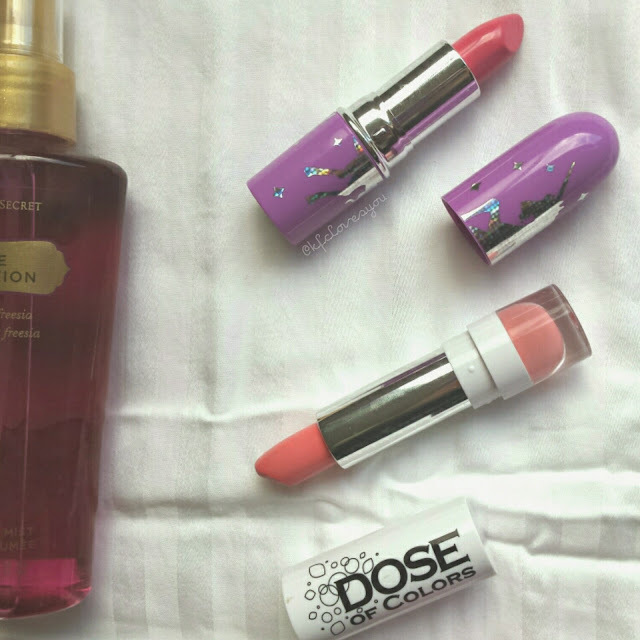 Dose of Colors lipstick in Playdate: I did another full review on this lippie here. I don't wear this one as much but it doesn't mean I like it any less. This one is seriously a fun paler and brighter pink. It is definitely one of those colors that makes my skin look tanner than it is when I wear it. Too Cool For School Strawberry Milky Tint: I also did a full review on this product here. I think this would have to be one of my most favorite every day lip tints. I reach for this one the most mainly because of how light the color is. It is nice and cooling on the lips and you can also build the color to be more pink. It looks natural on and does leave a nice stain to the lips. What are you favorite pink colors or products that are pink (skincare, candles, snacks, etc). Let me know in the comments! Hehe, I know right? I am pretty sure I bought it because of how cute it was and just hoping it would be a decent product and it turned out to be a nice balm too! 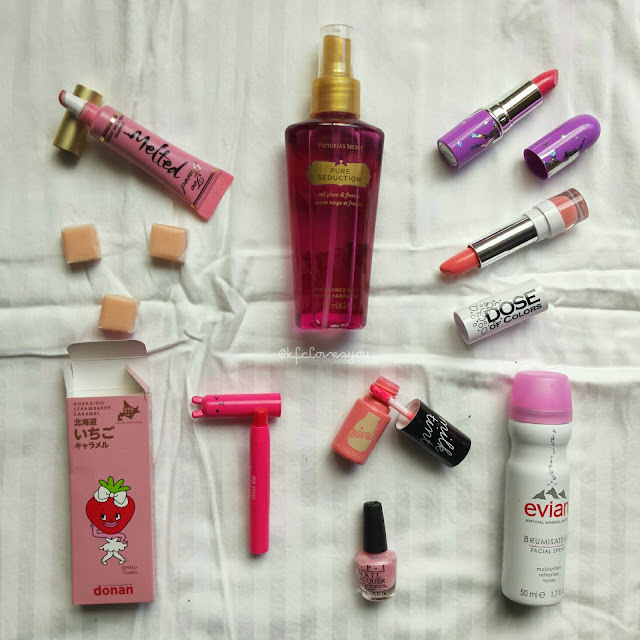 The Evian spray was perfect for when I was traveling especially on those dry air plane rides! Perfect for a pick me up in the middle of the day too!